Lattice Atlas is an application that aggregates data from various sources, segments customer information, and activates your growth across different channels. With Lattice Atlas, you can bring together all materials regarding your clients and prospects in a single platform and enable the in-built artificial intelligence engine to build your audience base organically. After that, you can reach these potential consumers through personalized approaches in the best avenues of communication. Once your strategies are underway, you can stringently monitor impact among your target customers in real-time. Lattice Atlas even assists you in evaluating your program’s performance for you to determine whether you need to upgrade or change your tactics for better reach and enhanced conversion. As Lattice Atlas synthesizes your data, it automatically builds your audience and highlights high-value accounts specifically. This way, you do not waste time on prospects that have low conversion possibilities. As such, you can focus your attention towards in-market accounts that can help drive business growth. You may have a general framework as to how you can convince your prospects to convert. However, you can increase the likelihood of turning potential customers into paying clients with personalized content. You can do this with the help of Lattice Atlas as it lets you know what their common attributes are. There on, you can create, segment, and customize content for use in specific scenarios. Once your tactics are in place, you can active your campaigns across different channels. Lattice Atlas affords you the ability to engage with customers in whichever platform they prefer. This way, you can delight your audiences by showing them that you care about their partialities. With your campaigns underway, it is imperative that you keep an eye on their performances. This is important so that you can adjust and alter your engagement strategies when needed to optimize the conversion setting. Lattice Atlas provides you with the dashboard where you can monitor performances in real-time and evaluate their progress for you to make intelligent decisions. If you are considering Lattice Atlas it might also be a good idea to check out other subcategories of Best Predictive Analysis Software gathered in our database of B2B software reviews. Every company has different requirements and needs an application that can be customized for their size, kind of workers and customers, and the particular industry they are in. For these reasons, no software can offer perfect features off-the-shelf. When you search a software system, first be sure what you want it for. Read some Lattice Atlas reviews and ask yourself do you need basic features or do you want complex functionality? Are there any industry-specific features that you are searching for? Get the answers to these queries to help your search. There are lots of factors that you need to mull over and these include your finances, particular business wants, your company size, integration requirements etc. Take your time, check out a few free trials, and finally zero in on the app that provides all that you need to enhance your firm effectiveness and productivity. 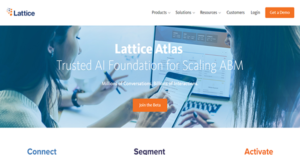 How Much Does Lattice Atlas Cost? Lattice Atlas is a platform that helps you scale your ABM with predictive marketing and sales analytics. If you are interested in driving your business growth with this application, you can request further information and custom enterprise pricing from the sales team by phone, email, or web form. We realize that when you make a decision to buy Predictive Analysis Software it’s important not only to see how experts evaluate it in their reviews, but also to find out if the real people and companies that buy it are actually satisfied with the product. That’s why we’ve created our behavior-based Customer Satisfaction Algorithm™ that gathers customer reviews, comments and Lattice Atlas reviews across a wide range of social media sites. The data is then presented in an easy to digest form showing how many people had positive and negative experience with Lattice Atlas. With that information at hand you should be equipped to make an informed buying decision that you won’t regret. What are Lattice Atlas pricing details? What integrations are available for Lattice Atlas? If you need more information about Lattice Atlas or you simply have a question let us know what you need and we’ll forward your request directly to the vendor.